The rider represents a ferocious warrior of the Huns which people invaded Europe from Central Asia in the fifth century. The rider has directed his horse to a human skull lying on the ground and he takes a closer look with a grin on his face. The horse, however, is reluctant, averts its head, keeps its forelegs stiff to avoid further movement ahead. The sculptor has created an usual equestrian statue which is in contrast to the traditional horse and rider sculpture. Here the rider is no hero who has to be glorified, but a rider who should be reviled. The horse is used to demonstrate the evilness of the rider. 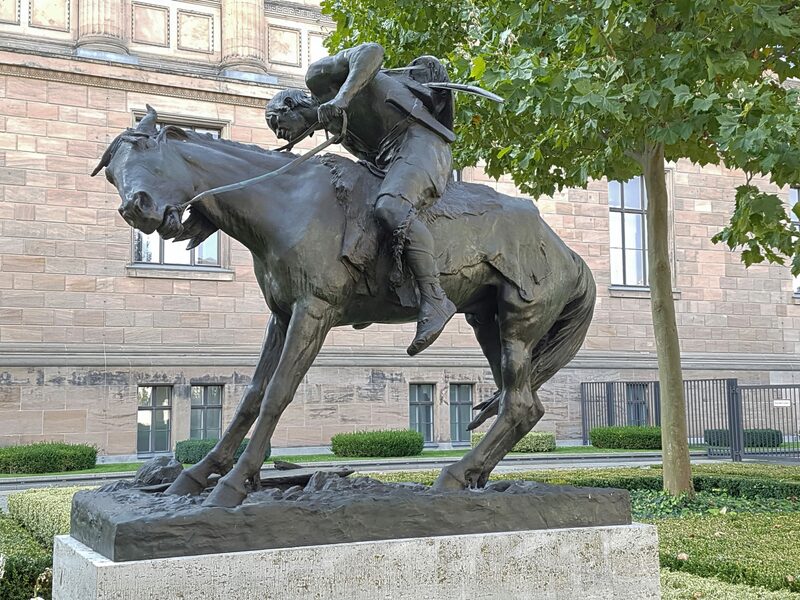 At the same time the sculptor showes his mastery in the position of the rider on his horse. Riding without saddle and stirrups requires athletic qualities and much sense of balance, which this rider clearly shows. The horse has been rendered in an extreme position to resist the rider’s action. With this work the sculptor proves his knowledge of anatomy and movement. It also is an example of symbolism in the shape of a very realistic scene.